There are 4 types of pleural diseases: pleurisy, pleural effusion, pneumothorax and pleural mesothelioma. Pleural mesothelioma is a malignant condition of pleura related to asbestos exposure occurring rather infrequently in our country compared to other lung cancers and is beyond the purview of this review. 1. Pleurisy is defined as an acute inflammation of the pleura. The inflammation can be primary or secondary due to spread from an adjacent structure. 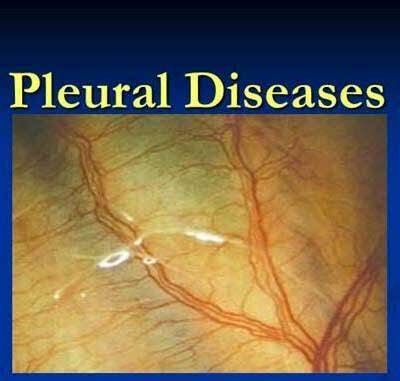 Primarily, viral infections of the pleura result in pleurisy. Secondarily, the pleura may be involved due to pneumonia or pulmonary infarction. The present review is restricted to ‘primary’ pleurisy. 2. Pleural effusion is defined as an excessive accumulation of fluid in the lungs. There are mainly two types of pleural effusions: transudative and exudative pleural effusion. Fundamentally, transudative pleural effusions reflect a systemic pathology and exudative pleural effusions reflect a local pleural pathology. Generally, transudative effusions are usually bilateral, whereas exudative effusions are usually unilateral. The common causes of transudative pleural effusions are congestive heart failure and hypoalbuminemic states (cirrhosis, nephrotic syndrome). 3. Pneumothorax is defined as air in the pleural cavity resulting in collapse of the whole lung or some part of the lung. It may be traumatic or spontaneous. Traumatic pneumothorax can result in a life-threatening condition due to tension pneumothorax. Spontaneous pneumothorax may occur without any associated underlying lung pathology (primary) or may be associated with underlying lung pathology (secondary). The common secondary causes include tuberculosis and chronic obstructive airway disease. Smoking and marfanoid habitus are important risk factors. Secondary pneumothorax is a more critical condition as the underlying lung is already compromised. Optimal treatment of primary systemic illness. Abstinence from smoking, alcohol and other substance abuse. 1. Pleurisy: sharp pain in the lateral hemithorax characteristically increasing on inspiration and coughing. 2. Pleural effusion: may be asymptomatic or associated with dull aching pain on the affected site. Dyspnea, dry cough may also be present. Symptoms of underlying systemic pathology may be associated. 3. Pneumothorax: sudden onset excruciating pain associated with dyspnea especially in a smoker. 1. Pleurisy: acute history of fever, pleural rub. 2. Pleural effusion: findings of primary systemic disease, local examination reveals decreased tactile fremitus, stony dull note on percussion and absent breath sounds on auscultation. 3. Pneumothorax: marfanoid habitus, local examination reveals decreased tactile fremitus, tympanitic note on percussion and absent breath sounds on auscultation. 1. Pleurisy: No specific investigation per se. Patients with pleurisy normally improve in 7-10 days. Chest X-ray (PA and lateral views of chest radiographs): 50 ml fluid can be appreciated on lateral chest radiograph as a meniscus in the posterior costophrenic angle. Lateral decubitus film helps in differentiating a loculated effusion from a free fluid effusion. Ultrasound: USG helps in confirming a pleural effusion as compared to pleural thickening, which many times cannot be appreciated on a chest radiograph. It is also useful in diagnosing loculated effusions, subpulmonic and subdiaphragmtic pathology like an amebic liver abscess. Diagnostic thoracocentesis performed with/without US guidance is the investigation of choice to differentiate between a transudative and exudative pleural effusion. This differentiation is the sheet anchor of further management. pH: normal PF pH is 7.64. Bacteriology: Gram stain and culture sensitivity in addition to pH are very important investigations to decide regarding the management in cases of parapneumonic effusion vis-à-vis empyema. Chest radiograph: collapsed lung at the hilum with absence of lung markings in the periphery. Important to evaluate the contralateral lung radiographically-normal or abnormal for management. 1. Pleurisy: symptomatic treatment with non-steroidal inflammatory drugs. If symptoms persist, evaluate for pleural effusion. In a transudate, the primary cause has to be managed. It needs to be remembered that in cases of suspected empyema, establishing the diagnosis as early as possible after admission is the key. A delay in the institution of ICD even by a few more hours results in more fibrosis and loculations, which further complicate the long term management. Large pneumothorax requires simple aspiration. If lung does not expand then tube thoracostomy.